An estimated 150,000 textiles were found in Egyptian burial sites that date from the late third to mid-seventh century C.E., Egypt's Coptic Period. Most of these grave goods were fragments of clothing and domestic textiles, but some were nearly complete costumes. These archaeological fabrics represent the fashions and furnishings of that distant time and place. Egypt was conquered by Alexander the Great in 332 B.C.E., then colonized and ruled by Greek pharaohs, the Ptolemies. After 30 B.C.E. Egypt was ruled from Rome, later from Byzantium, and briefly from Persia prior to the Islamic conquest of 641 C.E. Christianity became the dominant religion during the Coptic Period. A "Copt" in early usage identified an indigenous Egyptian, but in modern usage only a Christian Egyptian is a Copt. After 451 C.E. the Coptic Church separated from the Roman Catholic Church. There are six million Copts in 2004. Christian burial practices were adopted after the prohibition of mummification in the fourth century C.E. The deceased were dressed in their garments, swaddled with other cloth, and buried in sandy, shallow graves; or, in some instances, in small brick-covered vaults. The dry desert clime preserved the textiles. 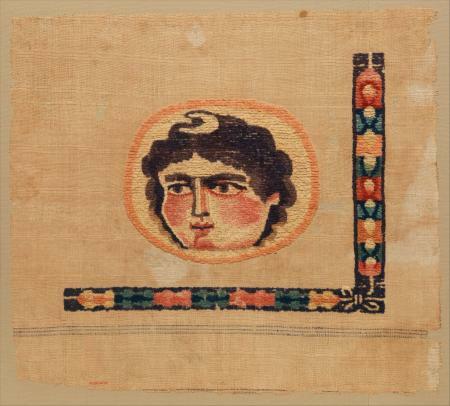 Some Coptic textiles were discovered as early as the seventeenth century and others during Napoleon's expedition to Egypt. Nineteenth and early-twentieth-century excavations at Saqqâra, Akhmîm, Hawarah, Karanis, and other sites by Theodor Graf, Wladimir Bock, Gaston Maspero, Sir Flinders Petrie, and other Egyptologists contributed to the textile collections of European museums. However, the impact of Coptic textiles on the history of clothing, fashion, art, and archaeology can best be understood by examining the career of the charismatic, but controversial, French Egyptologist Albert Gayet (1856-1916). He collected tens of thousands of textiles between 1895 and 1910, primarily from Antinoé (ancient Antinoöpolis), but also from Akhmim, Sheikh-Shata, Deir-el-Dyk, and Dronkah. Gayet believed he had discovered at Antinoé " … an efflorescent civilization to rival Pompeii." Gayet became known as "The Archaeologist of Antinoé." Antinoé was founded in 130 C.E. by Emperor Hadrian. Drawings of Antinoé made during Napoleon's 1804 expedition to Egypt reveal the grandeur of this Greco-Roman city with its broad avenues, impressive triumphal arches, temples, theaters, and baths. The city was colonized by cultured, literate citizens of Greco-Egyptian ancestry who called themselves the New Hellenes. Antinoé slowly declined after the seventh-century Islamic conquest of Egypt. Eventually, even the architectural remnants of the city disappeared. By the time of Gayet's excavations there was only a small mud-brick village called Sheik Abada at the site. The Pre-Coptic category (first to late third centuries C.E.) includes only a few painterly examples. The Early Coptic, Proto-Coptic, or Late Roman-Egyptian category (late third century to fourth century C.E.) is dominated by Greco-Roman influence with themes drawn from nature and mythology. Subtle modeling with blended colors can be seen in the polychrome textiles and fluency of line is evident in the monochrome faces and figure drawn with the ecru linen wefts. Monochrome interlace and endless knot motifs are also popular and enduring. The Middle Coptic, High Coptic, or Early Byzantine (fifth to mid-seventh century C.E.) is categorized by the abstraction of naturalistic elements. Color areas, no longer blended, are separated by heavy outlines or juxtaposed. Faces and figures are distorted. Christian saints and symbols begin to replace the pagan iconography. The Late Coptic (mid-seventh to twelfth century C.E.) category extends into the Islamic period in which geo-metric patterns and calligraphic motifs supersede figurative art. Polychrome and monochrome palettes were used throughout all phases and some popular themes, especially dancing figures and interlace patterns persisted. While there was continuity throughout the Coptic period in the construction, composition, content, and palette of the tapestries there were profound changes in the iconography. The naturalistic style of rendering faces, figures, and narrative vignettes was altered by abstraction, and familiar Greco-Roman motifs and themes were imbued with Christian messages. After each winter's expedition to Egypt, the fabrics and artifacts-even mummies-were brought back to Paris for exhibitions by Gayet. His displays in Paris featured tunics, mantles, shawls, head coverings, leggings, shoes, socks, cushion covers, curtains, wall hangings, strips of precious silk, coats of cashmere, mummy portraits on linen, and woolen tapestry fragments decorated with flora, fauna, figures, geometric motifs, and narrative vignettes in polychrome and monochrome palettes. He presented lectures with dancers dressed in faux Coptic garments. During the Paris Exposition Universelle de 1900, Gayet displayed textiles at the Palais du Costume in "sensational tableaux." The costume exhibit was for the "glorification of feminine fashion from the nineteenth century back through history to the Late Antique world." In 1901 Gayet became a celebrity for his discovery of the mummy of Thaïs, a legendary fourth-century converted courtesan and popular heroine of Anatole France's 1890 novel and Jules Massenet's 1894 opera. Gayet estimated that he had uncovered forty thousand graves by 1902. Eventually the Gayet acquisitions were doled out to the Musée du Louvre and other museums in France. Gayet collections are also in museums in Italy, Belgium, and Switzerland. Many Gayet textiles, sold to public and private collections, are now scattered around the world. 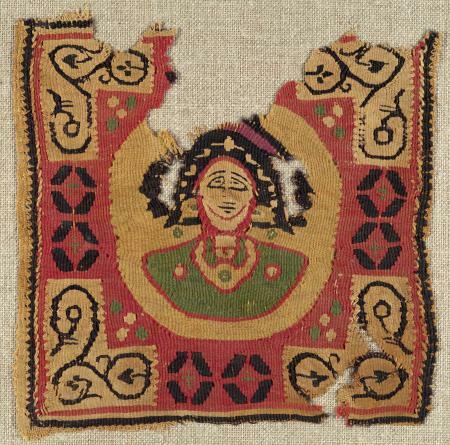 Often early Islamic textiles are included in Coptic collections. No radical difference in the way cloth was made resulted from the political change, however, the iconography slowly segued toward the Islamic taste for nonrepresentational art. Few of these early excavators preserved archaeological context or recorded sufficient documentation to accurately date the fabrics: clues in the cloth and design are all that remain. The dominant fiber of Egypt's ancient and late antique fabrics is flax. The common Coptic linen yarn is an s-spun single (yarn spun in a clockwise direction), but z-spun yarns (yarn spun in a counter-clockwise direction), single or plied, are used with certain tapestry styles considered late and perhaps Near Eastern. The typical woolen yarn used during the Coptic period is an s-spun single. Occasionally z-spun yarns, and-in rare instances-plied yarns of two colored strands spun together are found. Silk, imported as fiber or fabric, was a rarity in Egypt. Soft weft (crosswise yarns) fibers of cashmere are found on some imported garments. Cotton and ramie are reported in Coptic and early Islamic fabrics. Precious gold thread can be documented on two separate pieces in French collections. Linen, which does not readily accept dyeing, is typically undyed: wool readily accepts dyestuffs. Every color of the rainbow can be found in Coptic cloth. Blues were from indigo and woad; yellows from saffron, pomegranate, suntberry, weld, broom, iron buff, and safflower; reds from alkanet root, madder root, kermes, henna, and lacdye; and purples from lichens and from the glands of shellfish of the Purpuridae family. The accepted theory among Coptic scholars is that wools were dyed in the fleece prior to spinning. Horizontal ground-staked looms and upright vertical looms were in use in New Kingdom Egypt. The Alexandrian conquest brought warp-weighted looms to Egypt, but they were not extensively used. Pit-looms and upright Roman looms may have been used. There are tablet-woven textiles and sets of tablets that were discovered in Antinoé. Some type of loom with a pattern-making device, a precursor of the drawloom, was in use during the Coptic Period. 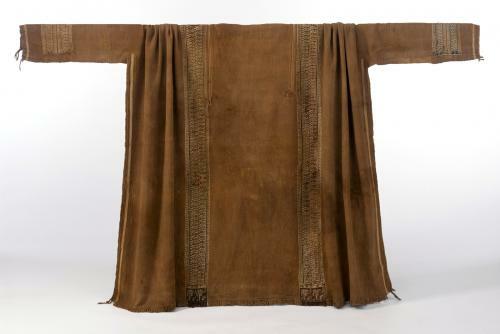 The one-piece tunics so common in Coptic Egypt must have been woven on looms eight or nine feet wide. Many types of fabrics were found in Coptic burial grounds: tabby or plain weaves, plaid tabby weaves, tapestries, tabby-tapestries, extended tabby or basket weaves, weft-loop weaves, warp-loop weaves, brocades, tapestries, taquetés (weft-faced compound tabbies), and samitums (weft-faced compound twills), resist-dyed textiles, warp-faced tablet weaves, sprang, knits, and some embroideries. Weaving was a guild or government controlled industry, but also always a cottage craft. The technical skills and artistry ranged from the rustic to the sophisticated and sublime. There came into fashion in the late Augustinian age a "smooth cloth with woolen decorations." This is the quintessential cloth of Coptic Egypt, a combination tabby-tapestry (inserted tapestry) weave used for tunics, shawls, curtains, cushion covers, and large wall hangings. The basic fabric is a slightly warp-dominant tabby of linen warp and weft with an average sett of 56 ends per inch. The tapestry decorations are woven on the same linen warp with dyed woolen and ecru linen wefts. The transition from tabby to tapestry is typically achieved by grouping the warp in sets of two of more. This changes the average sett to 28/2 ends per inch and allows the weft yarns to pack down and completely cover the warp. Tapestry at this sett has a soft and wearable handle, not like the heavy, dense fabric of kilim rugs or medieval wall hangings. Scholars believe that tapestry weaving came to Egypt with the Greek colonists. The tapestries of Coptic Egypt range in size from mere shreds of warp and weft to wall hangings nine yards long with nearly life-size figures. There are all wool tapestries as well as those of linen and wool. Weavers knew traditional methods of dealing with slits and joins. Early polychrome tapestries shade and blend color areas, while later pieces have separate segments of bold color. Some special techniques were used on the monochrome tapestries. Silhouette-style figures in white linen or dark wool yarn were woven on a mid-value background with a supplementary sketching-weft defining features on the tapestry faces and figures and patterns on a tapestry field. The common costume of Coptic Egypt-as ubiquitous as blue jeans are in the early 2000s-was a tunic with tapestry embellishment. The one-piece tunic of tabby-tapestry was woven from cuff-to-cuff on a hem-to-hem loom width with a slit for the neck opening. To finish the garment the fabric is folded at the shoulder line and seamed up the sides. Some tunics were woven in sections on a narrow loom and then pieced together. Tapestry cuff bands, shoulder or knee medallions, yoke panels, hem bands, and clavi (weft-wise bands) decorate the tunics. The clavi, which become the vertical strips of tapestry running down the front and back of the tunic, can be recognized as an early twenty-first century priestly stole. Men's decorations were typically monochrome, while the women's were often polychrome. Though there are variations in the size and arrangement of tapestry embellishments, the tunic stays in style for nearly a thousand years. Precious tapestry remnants were recycled and appliquéd on other tunics. Brocaded bands, tablet-woven bands, scraps of patterned taqueté or samitum, and some separately woven tapestry bands were sewn to tunics. All wool tunics, decorated with tapestry and some with hoods, were also found. In frescoes, mosaics, and both secular and sacred manuscript illustrations from the early medieval world one can identify the same type of cloth and costume found in the necropolis of Coptic Egypt. The Antinoé Riding Coat is an elegant knee-length coat nipped in at the waist with long flaring sleeves. Though found in Antinoé, they are considered Near Eastern. The coats of wool or cashmere were dyed a luscious red or blue-green. Scraps of delicately patterned silk samitums-the first draw-loom fabrics found in the western world-were used as facings and trim on these garments. Shawls of linen tabby-tapestry textiles decorated with lavishly colored flowers, dyed woolen shawls, and perhaps silk scarves for the wealthy were worn over tunics. Patterned taqueté woolens, that Gayet found used as duvet covers, were probably reused mantle fabrics. Tapestry leggings, knit socks, leather mules embossed with gilt, and leather sandals with perforated straps were all found in Coptic graves. Hairnets of sprang, as well as bags, made of linen or linen and wool were a fashion item of the day. A bourrelet de chenille is an unusual women's head ornament worn to frame the face. A bourrelet is a roll of material and chenille is French for caterpillar-an apt description for this fuzzy roll of multicolored, long woolen weft-loops on a linen fabric. Thaïs is illustrated in Gayet's book wearing a bourrelet de chenille. Gayet's many exhibits of Antinoé textiles-especially the one he created for the Palais du Costume at the Paris exposition of 1900-inspired costumes for opera, theater, silent films, and even a haute couture gown by Mariano Fortuny. Embroiderers could find Coptic patterns in three booklets published by Dollfus-Meig Company. Rodin collected Coptic textiles. Matisse and other Fauve artists, fascinated by Coptic tapestry art, discovered a new way of interpreting color, shape, and archaic scenes. 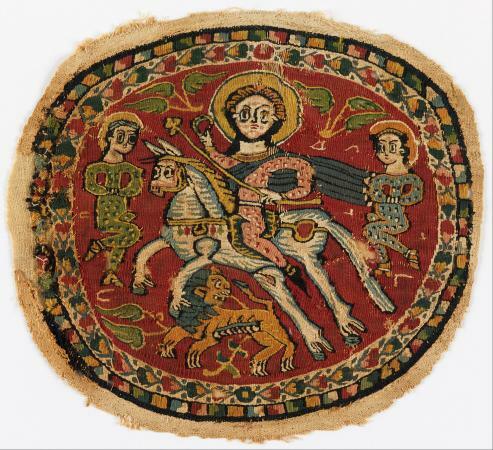 The impact of Coptic textiles continues with new excavations, exhibitions, and publications. Gayet believed that the exploration of Antinoé was "… the resurrection of a lost world" and the artifacts "… of inestimable value for the history of art." His dream of an Antinoé museum was never realized, but the textiles discovered by Gayet-once quotidian cloth- grace modern galleries of museums around the globe. The diverse textile themes, techniques, and technology reflect influences from the languishing classical, flourishing Christian, and emerging Islamic world. See also Natural Dyes; Loom; Byzantine Textiles; Weave Types. Du Bourguet, Pierre. Musée National du Louvre Catalogue des etoffes coptes. Paris: Editions des Musée Nationaux, Ministere d'Etat-Affaires Culturelles, 1964. Hoskins, Nancy Arthur. The Coptic Tapestry Albums and the Archaeologist of Antinoé, Albert Gayet. Eugene, Ore.: Skein Publications in association with the University of Washington Press, 2003. Lorquin, Alexandra. étoffes Égyptiennes de l'Antiquité tardive du musée Georges-Labit. Toulouse: Somogy Editions d'Art, 1999. Martiniani-Reber, Marielle. Soieries sassanides, coptes et byzantines V-XI Siècles. Paris: Editions de la Reunion des Musées Nationaux, 1986. Rutschowscaya, M. H. Coptic Fabrics. Paris: Musée du Louvre, 1990. Santrot, Marie-Hélène, M. H. Rutschowscaya, Dominique Bénazeth, and Cécile Giroire. Au Fíl du Níl: couleures de l'Egypte chrétienne. Paris: Somogy Éditions D'Art, 2001. Trilling, James. The Roman Heritage, Textiles from Egypt and the Eastern Mediterranean 300 to 600 A.D. Washington, D.C.: The Textile Museum, 1982.